We are very proud of all the youth we have integrated in our church, but at the same time, we realize how important it is to reach all age groups. Happily we now have six women who have accepted Christ and have joined our church. We have begun meeting on Wednesday afternoon for Bible study and fellowship. Since few if any of them bake, I decided to do a little baking with them. 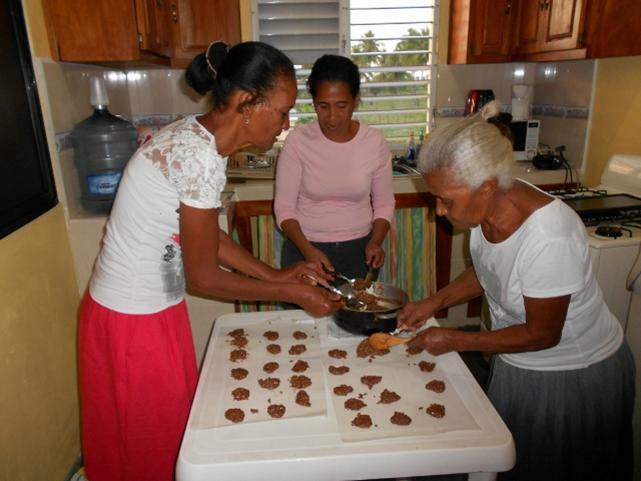 They have learned to make no-bake cookies and oatmeal cookies. What fun they had! Life for women in the rural villages is a lot of work and it is wonderful to see them having a little fun. Many are raising their grandchildren and seldom do anything for themselves. It is important that the church serve as a loving support for these women, some who are widows and very lonely. Yes, it is true. 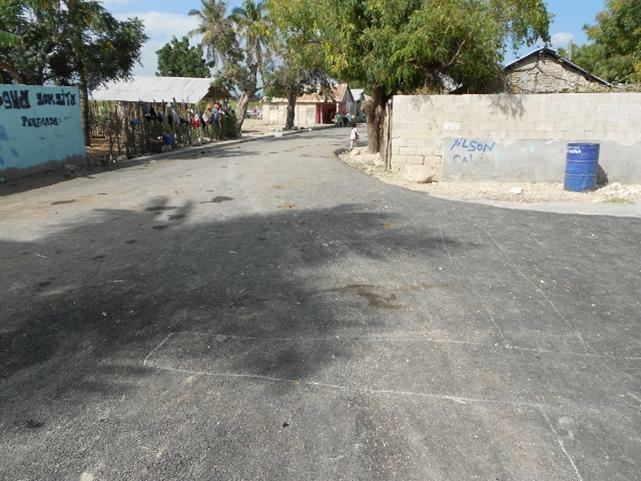 The main road through Bombita has been paved. This includes the entire entranceway to the COPA school and clinic. It will help so much to cut down on the dust that is tremendous around the COPA property. We have found that it is very important to have special ‘themed’ services to attract new people to the church. In this way, we encourage people to ‘come and see.’ In February we had a “Bring a Friend Service.’ We had lots of fun activities as it was the Saturday evening youth service and many came. Not all the visitors stayed for the picture so it was actually more than you see here. We are trying to improve our ‘follow-up’ ministry so more will return for other services.We also had a special service for Day of Love and Friendship which is also known as Valentine’s Day. Again we filled the youth service with lots of fun activities, but we also had a special message of love from God! Baptisms are always very special times in the life of our church. 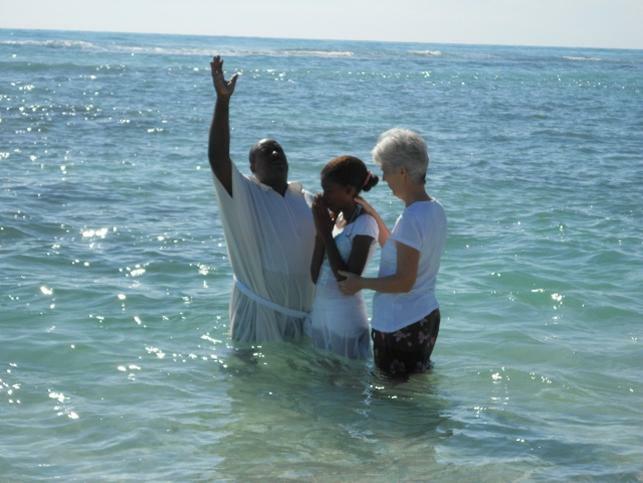 After months of preparation we went to the beach and three youth and one adult was baptized. While the Evangelical Church does believe and teaches infant baptism, practice has not yet accepted in in many areas. We dedicated another baby in our Sunday service and we are happy that these new mothers are bringing their babies to be dedicated. It gives us a good opportunity to speak to them about their responsibility to raise the child in the way he/she should go and that means leading by example. 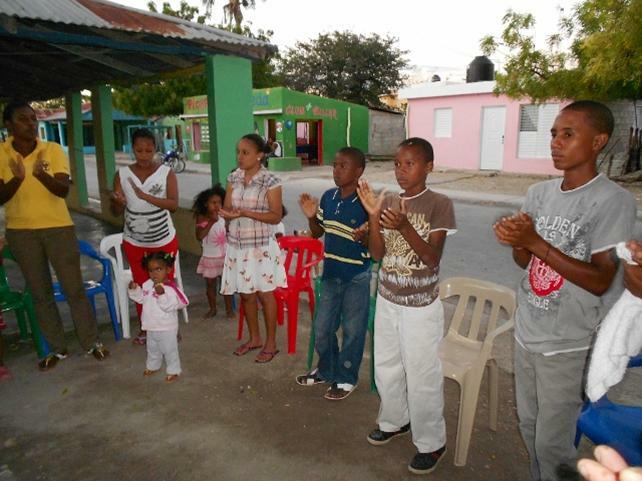 We hope the mothers will continue to attend the church and hopefully make their commitment to Christ. Much of my work here is leadership development. 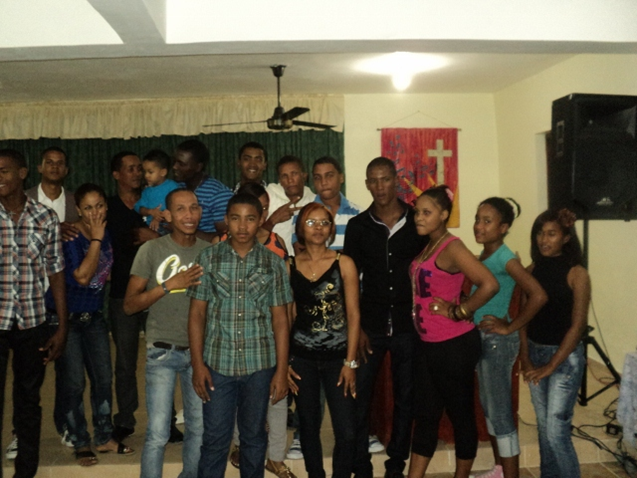 With a church made up of youth and young adults and adults with no church experience, much time is spent in training. The General Board of the United Methodist Church has sent various groups to hold training workshops which have helped a lot. Pictured here is Nairobi who attended a workshop on working with adolescents. She was so excited about what she learned, she returned and held a four week Bible study to pass on what she learned. 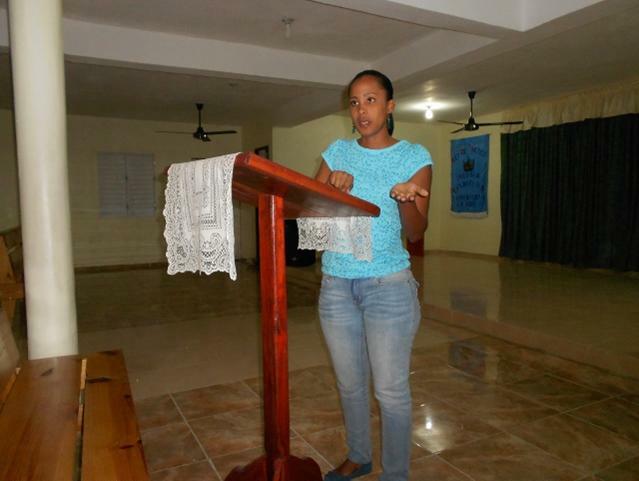 She has taken on the responsibility of working with the adolescents in our church and has shown a tremendous growth. We continue to have ‘house services’ which take place in front of the house so as to be a presence in the neighborhood. We try to invite neighbors to participate with us. In this way we at least get the Word of God to more people who maybe have not yet braved coming to church. If they won’t come to church, we’ll take church to them! My young folks do such a wonderful job bringing a message of evangelization to each of these services. Wouldn’t that be fun to do this in your neighborhood????? For health of everyone here due to increase of dengue fever. For fruits of our evangelism efforts. Prayers for all the teams that have visited us.